Map. Blazes ravaged Southern California in 2007. The American Red Cross used geographic information system (GIS) technology to prepare this map of the wildfires endured by the areas around San Diego, California, in 2007. 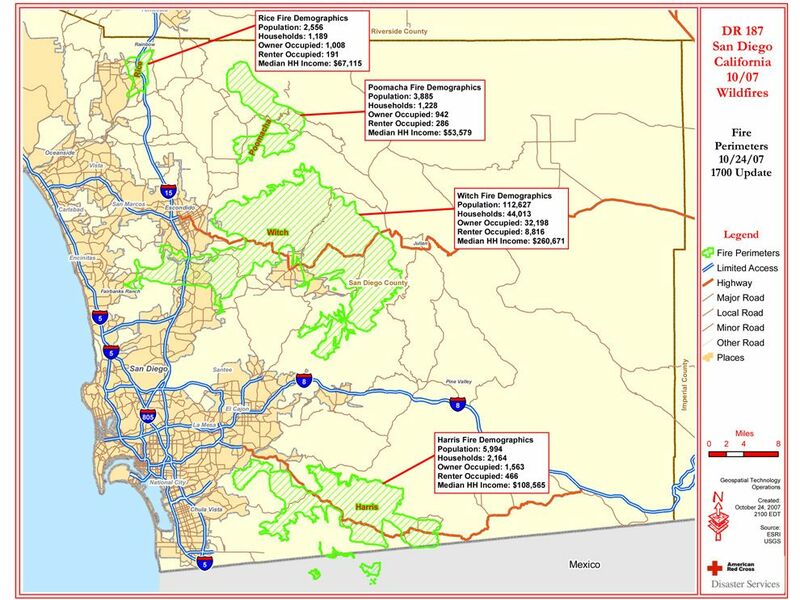 This map provides information on the demographics of fires that ravaged the San Diego Area in 2007. Which fire affected the area with the greatest population? Which fire affected the area with the smallest population? The Witch fire affected an area with a population of 112,627, the largest of the four major wildfires represented on this map. The Rice fire affected the area with the smallest population, 2,556 people. "Places," represented on the map by tan coloring, are specific areas, such as towns and neighborhoods. Which fire perimeter burned through the most places? The largest wildfire, the Witch fire, affected the most places. At its widest, what is the approximate width of the Witch Fire? The eastern part of the Witch fire extends about 16 miles. Look at the perimeters of the Rice and Poomacha fires. How do you think transportation and evacuation routes were affected by the fires in each area? Victims, firefighters, and relief agencies needed to be aware of alternate routes in both areas. The Rice fire hugged Interstate 15, a major freeway in Southern California. A portion of I-15 was actually closed, preventing access to the area's central evacuation route. The perimeter of the Poomacha fire included fewer major and minor roads. Victims and firefighters of the Poomacha fire had fewer road closures, but access to fewer roads to begin with. This map was created using GIS technology by cartographers at the American Red Cross, who organized and provided disaster-relief services to areas affected by the wildfires. Why do you think the Red Cross mapmakers included demographic information such as household (HH) income or the residents' status as owners or renters? Answers will vary! Demographic information helps the Red Cross effectively evaluate, plan, and implement relief teams in areas affected by the wildfires. For instance, population size helps the Red Cross determine how much food to provide and how large of an area to secure for emergency shelter. The perimeter of the fire may help the agency plan a location for a relief center that is both safe and convenient. Household income may help the agency asses damage to a home or other property after the fire. nonprofit organization that provides resources to disaster victims. having to do with the social characteristics and statistics of a population. any system for capturing, storing, checking, and displaying data related to positions on the Earth's surface. an event occurring naturally that has large-scale effects on the environment and people, such as a volcano, earthquake, or hurricane. an area within a larger city or town where people live and interact with one another. uncontrolled fire that happens in a rural or sparsely populated area.